Use TB311TK to reference this item. This coin wants to go from cache to cache to help people remember not to drive while distracted. Only a fraction of a second can change lives forever. This coin is part of the Todies Bike Awareness project to raise awareness of bikes (both motorized and human powered) on the roads. 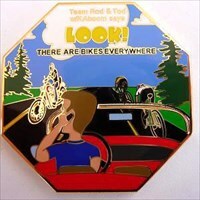 Specifically this coin is to get people to remember to not drive while distracted. There are many types of distractions that todays drivers face every day on the open road. Some of these distractions can be eliminated if we all just think before we drive.! Using high-tech devices like handheld organizers or laptops! and the list goes on and on. Take a moment to think about what you can do to make driving a safe experience for all ! NIET AANWEZIG IN DE VLIEGENDE HOLLANDER. NOT SEEN IN DE VLIEGENDE HOLLANDER. This entry was edited by jamayolo on Wednesday, 16 February 2011 at 02:38:42.
thanks for this beautiful coin. Gezien in de Vliegende Hollander. Gevonden in Niets aan te geven?, morgen maar weer een plekje elders in Vlaanderen. Up to the next cache.